UCD Marian recovered from their Hula Hoops National Cup final loss last weekend to come from behind to defeat Belfast Star 100-96 in Belfield on Saturday evening in a cracking battle in the Men’s Super League. Trailing for the most of the game, Marian truly found their rhythm in the fourth quarter when top scorers, Mike Garrow, Conor Meany and Mario Markovicz, wrestled their team over the line. Trailing by 84-73 with five minutes remaining in the fourth quarter, Garrow, Meany and Markovicz helped the hosts level proceedings at 90 points each with just under two minutes remaining and ultimately, foul trouble for Star saw Marian edge ahead from the free throw line. I’m happy with the result and the offence - but not with the defence. Unfortunately, this is not the way I like to win. I like to win games through defence, but tonight it’s been a really good day offensively. We know that Belfast Star’s game is based on three-point shots. We didn’t do a good job defending these shots and so they scored 11 three-point shots in the first-half. This win tonight is huge for two reasons; firstly, we recovered after last week, and secondly, we’ve defeated Belfast and so we’re now in the same situation. From here we can challenge for the league. Elsewhere around the league, Keane’s SuperValu Killorglin almost caused the upset of the weekend meanwhile, as they lost out to league leaders, Templeogue, by just one point on Saturday evening, 87-88. With nothing in it at half time, a big second half was expected and it certainly delivered. Templeogue came out strong in the third quarter, with Neil Randolph, Dee Proby and Jason Killeen getting in some big scores to see them stretch into a 63-79 lead going into the last, but the hosts were not going down without a fight. A thrilling fourth quarter ensued, and with Daniel Jokubaitis and new American, Shaquille Dance, leading the way, the teams were level with 30 seconds to play, but a Dee Proby free throw secured the win for Templeogue. Cup champions, Pyrobel Killester ran out 77-86 point winners over C and S Neptune in Cork thanks to a 24-point game from Royce Williams, Garvey’s Tralee Warriors stormed home to a big 89-55 point victory at home to DCU Saints, Maree booked another big win at home, running out 74-64 point winners over Griffith College Swords Thunder while UCC Demons had the better of Moycullen, 95-82. Over in the Women’s Super League meanwhile, Courtyard Liffey Celtics almost lost their unbeaten run this season thanks to a determined and clincial display from Pyrobel Killester. A massive 26-point fourth quarter was what sealed an 11th league win in a row for the Cup champions, after they trailed the Dubliners for the previous three quarters. Indeed, after a neck-in-neck opening quarter, it was Killester who began to up the intensity, with Christa Reed and Hannah Thornton driving their side forward to see them into a 28-35 point lead at half time. Liffey’s woes continued into the third as Killester continued to dominate at both ends of the floor, and heading into the fourth, the visitors had a 37-52 point cushion. 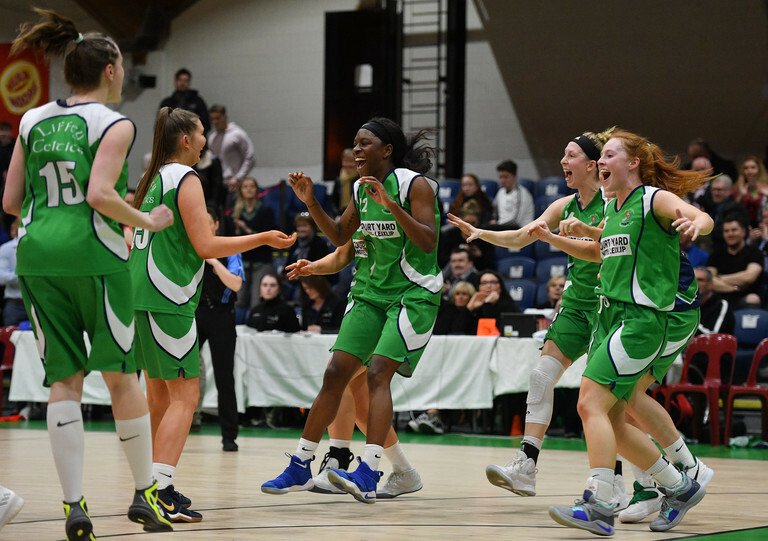 It was a fourth quarter that certainly dazzled fans though, as Liffey dug deep with Allie LeClaire, Aiblhe O’Conor and Briana Green running the pace, and with the lead firmly chipped away, Liffey got across the line 63-58 in the end. The two sides face each other yet again next Sunday over in the IWA in Clontarf. “That was such a tough game to face after the Cup final last weekend,” reflected head coach, Mark Byrne. We knew coming into it that Killester were full of talented players and would be up for it. Unfortunately, we were flat for the first three quarters, which was understandable after the high of last week, but I’m so proud of my players – they never gave in and played their way into some form and rhythm. To win the fourth quarter 26-6 was amazing – it summed up all of our talent and passion. I’m delighted. Elsewhere, Singleton SuperValu Brunell bounced back from their Cup loss in style on Friday night, running out 63-74 point winners over Cork neighbours, Ambassador UCC Glanmire, in a big Cork derby. Amy Waters was the stand out for Brunell on the night, top-scoring for her team with 20 points in a game that delivered end-to-end action from the get go. NUIG Mystics were stopped once more in their drive for their first league win of the season as, despite leading Maxol WIT Wildcats all the way through until the fourth quarter, the visitors stepped up down the stretch, with Allysa Velles and Stephanie O’Shea delivering the killer shots to see them win out 66-73. Fr Mathews got revenge on IT Carlow Basketball on Saturday afternoon meanwhile, with Grainne Dwyer top scoring her side home to a three-point victory over the hosts, 61-64. The last game of the weekend meanwhile saw DCU Mercy overcome Marble City Hawks in Dublin on Sunday afternoon, 73-49. A solid display from Mercy saw them power through in the third quarter, with Bronagh Power Cassidy and Rachel Huijsdens leading the way on the scoreboard.